I've not ridden a velomobile myself as yet. But if my observation about their design is not too ignorant, I don't see how a fully enclosed recumbent will be comfortable riding in hotter temperatures. For one thing, the recumbent now acts like a greenhouse, trapping the sun's heat in, while the other source of heat is the rider himself. Since the rider is actually doing work to pedal, heat is given out. How much heat? Its depends. To put things into perspective, even while at rest, an adult radiates heat at the rate of 80-90 watts (BMR = 1.2 watts/kg for a 70kg individual) as a result of basal metabolism. But now because of the recumbent being a greenhouse, the ambient temperature inside the vehicle rises. At higher temperatures, the body cannot radiate heat effectively. But the human body is a remarkable temperature regulation machine in that we have temperature sensors in our brain that activate the evaporative cooling mechanism when the ambient temperature is in excess of 30 deg F. But the catch here is that in order to get blood to the skin to aid in this process, there is some amount of cardiovascular strain on the rider's body. Irony also has it that as you sweat and lose more salts from the body, you face additional strain on your cardio system. Bottomline : someone sitting in a velomobile to travel extensive distances must have a cooling system already built into the vehicle, or he or she must be able to tolerate such temperatures and cardio strain within an enclosed space for long periods of time. I mean, what are the odds that you won't die of a heat stroke riding something like this? Let's not forget that one of the ultimate joys of riding a conventional bicycle is the soothing feeling of a cool breeze skimming your body. Are velomobiles designed to have vents in them as an escape mechanism for heat? Or must they come with a neat little air conditioning system of their own? I think if designers were to take live heat loads into design consideration (like the design of HVAC in a building), the velomobile will have great potential as a comfortable vehicle for longer distances. What do you think? 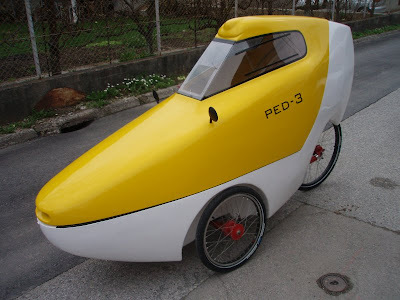 Have you ridden a velomobile? Do you find that their ventilation systems are adequate for long travel in hot temperatures? Let's discuss. Ron, first off I have to say it's a neat and cool little car. I like the idea behind it. However, I have to agree with you. It would not make a good vehicle for long distance drives, especially without some sort of cooling system. But even if it did have a cooling system, I would not want to be in one of those for a very long time because of how cramped you'd be in one. Although I didn't understand half of your scientific explanation, I still think I would have to agree with you. Are you going to get one now? Reminds of the movie matrix, where the machines harvested human fetuses for heat energy! I have never ridden a velomobile, but I have run across a number of randonneurs using them, and they seemed to have figured out how to deal with cooling even at slower speeds over very long periods of time. you can search for photos from Paris-Brest-Paris in 2007 by some interesting parameters, one of which is the type of bike. There is a category in the drop-down menu for velomobiles. PBP was cold and rainy that year, not hot, but even still, those riders had to have been prepared for hot weather as well. And they had to have ridden sufficient distances in their velomobiles so as to discover and solve any cooling problems before getting to PBP.